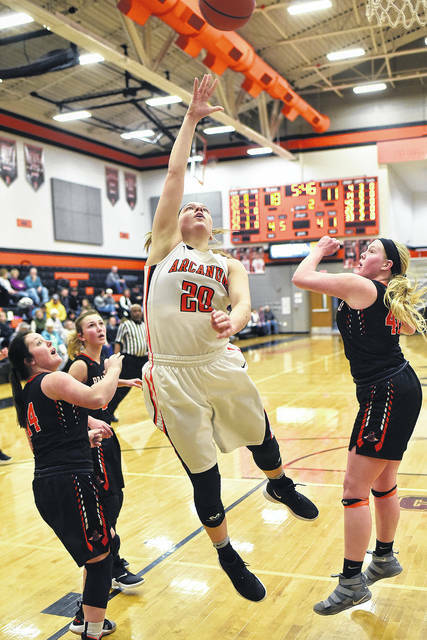 Arcanum’s Kayla O’Daniel (20) splits a pair of Bradford defenders as she takes the ball to the basket in a Cross County Conference battle on Tuesday night. O’Daniel had a game-high 17 points and the Trojans won the game, 48-40. Bradford’s Bianca Keener (40) goes after a rebound with an Arcanum player during a Cross County Conference battle on Tuesday night. The Trojans won the game, 48-40. 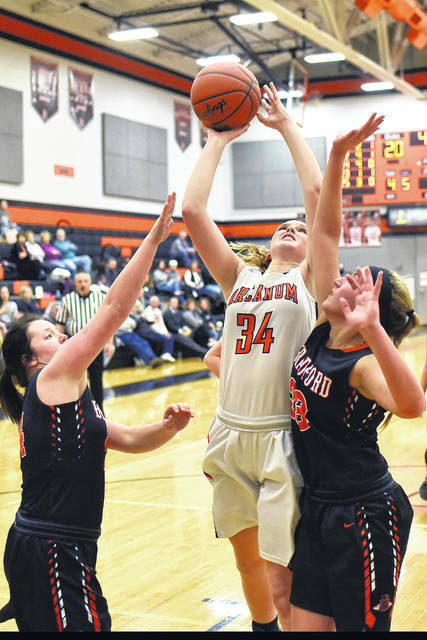 Arcanum’s Taylor Gray (34) puts up a shot with a couple of Bradford players surrounding her during a Cross County Conference battle on Tuesday night. The Trojans won the game, 48-40. Bradford’s Abby Fike shoots from underneath the basket during a Cross County Conference battle at Arcanum on Tuesday night. The Trojans won the game, 48-40. Bradford’s Austy Miller shoots from in front of the basket during a Cross County Conference battle at Arcanum on Tuesday night. The Trojans won the game, 48-40. Arcanum’s Camille Pohl (22) tries to get a shot off with a Bradford defender closely guarding her during a Cross County Conference battle on Tuesday night. The Trojans won the game, 48-40. 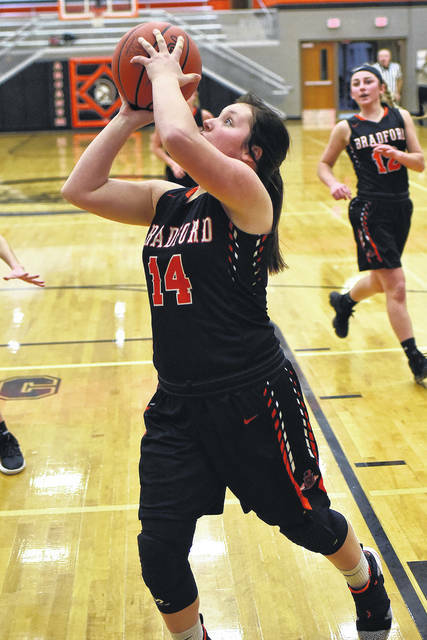 Bradford’s Emma Canan (12) shoots a 3-pointer from the top of the key during a Cross County Conference battle at Arcanum on Tuesday night. The Trojans won the game, 48-40. 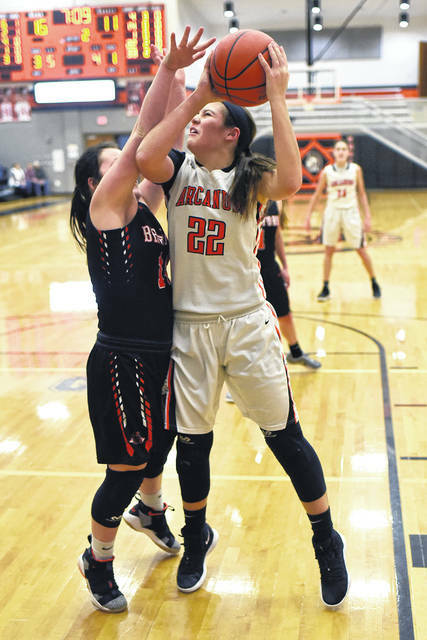 Arcanum’s Hailey Unger (14) puts up a shot over the outstretched arms of Bradford’s Bianca Keener during a Cross County Conference battle on Tuesday night. The Trojans won the game, 48-40. 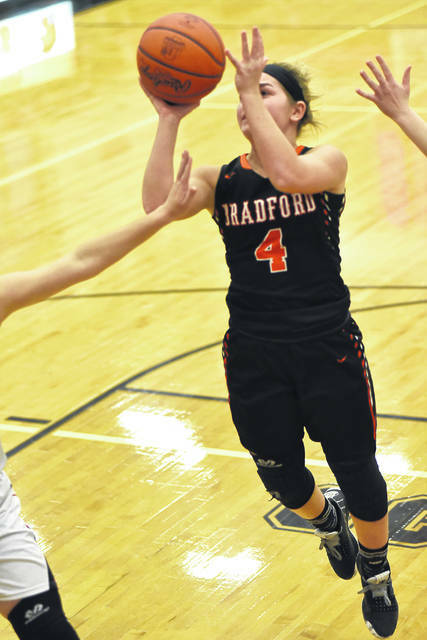 Bradford’s Rylee Canan takes a baseline jump shot during a Cross County Conference battle at Arcanum on Tuesday night. The Trojans won the game, 48-40. 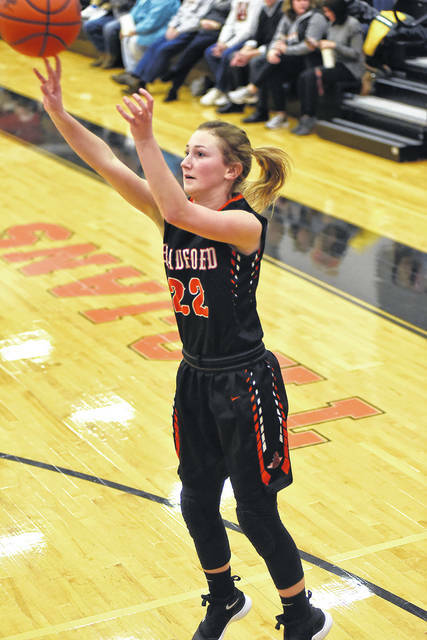 Arcanum’s Gracie Garno (23) shoots from just inside the free throw line during a Cross County Conference battle with Bradford on Tuesday night. The Trojans won the game, 48-40. 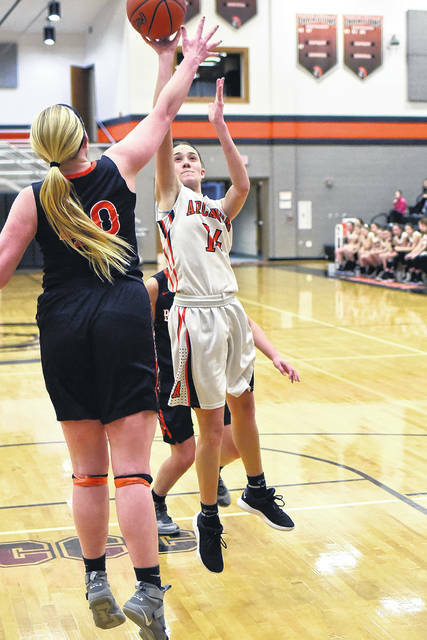 ARCANUM – The Lady Trojans showed maturity in their 48-40 win over the visiting Railroaders in girls basketball Tuesday night. Bradford came ready to play and led twice in the first quarter and on a triple by Austy Miller at the 3 minute mark the game was tied at 11. But the offenses would slow down after that with just one more score in the quarter, a triple by Madelyn Fearon to give Arcanum a 14-11 lead. The Trojans had good balance in the period with Taylor Gray and Hailey Unger both scoring 4 points, Fearon 3, Camille Pohl 2 and Gracie Garno 1. Bradford also spread out the scoring in the quarter. Miller had 3, Emma Canan, Rylee Canan, Cassie Mead and Bianca Keener all scoring 2 points each. 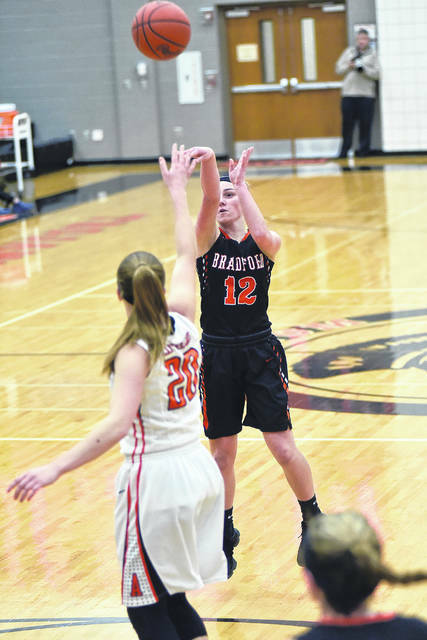 Arcanum expanded the lead to 10 points (23-13) in the second quarter as Bradford struggled with the defensive pressure applied by the Trojans, but they responded just before the half ended to close the gap to 24-17. The third quarter turned out to be a big one for Kayla O’Daniel as she scored 11 of her game-high 17 points in the quarter to help give her team a 40-31 lead. During the period, Arcanum showed great patience running its offense resulting in the most productive of the night with 16 points. “The girls are starting to understand the transitional attack versus running a half-court offense and some of that is due to a new system. 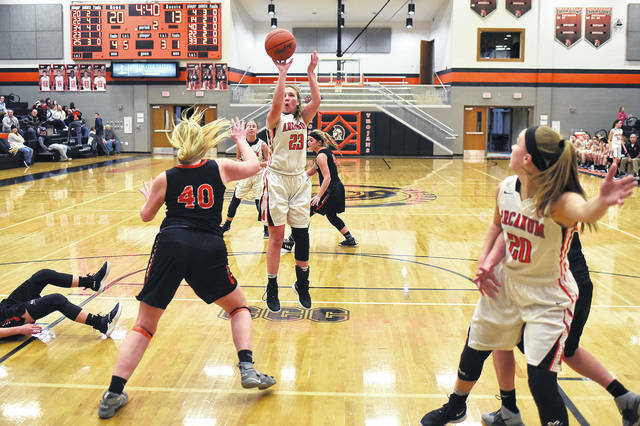 Early in the year we were Jekyll and Hyde going a 100 mph, it’s been a problem for us when we go against good teams who shut down our transition game and get us into a half-court,” Arcanum coach Michael Dean said. “I think we are maturing at the right time coming into the tournament and talk about a kid (O’Daniel) who has really come along in terms of understanding and surveying the floor properly, she has become a good leader and had a really good game tonight,” Dean praised. Going into the final stanza the Trojans decided to gamble and work on their stall offense and the guards did a good job of running time off the clock. Bradford kept making runs at Arcanum, but could never get close enough or make the play needed to get over the hump and they would eventually foul Arcanum sending them to the free throw line late where they Trojans went 4-for-4 and 11-for-17 for the game as they went on to claim the 48-40 win over a gritty Bradford squad. 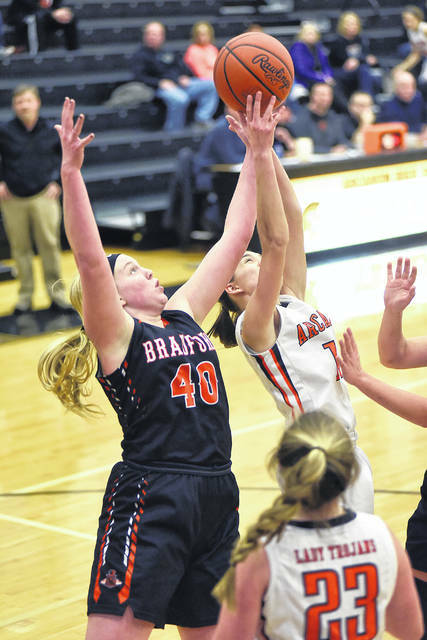 “We had a lot of missed opportunities and made some silly mistakes tonight that we’re going to need to eliminate to compete with some of the teams left on our schedule that are comparable to Arcanum,” Bradford coach Chris Besecker stated. “We’re coming along, we’ve got kids who played last year who are a year older and wiser, then you throw into the mix some good freshmen, especially Austy, it makes a difference, but tonight we just stubbed our toe every time we made a run. Give credit to Arcanum the made the plays needed and made their free throws,” Besecker concluded. Bradford was led by Austy Miller with 9 points and Emma Canan had 8. The Railroaders fall to 12-6 overall and 5-5 in the Cross County Conference. They will travel to Mississinawa Valley on Thursday. Arcanum’s coach was pleased with his team’s performance. “Our freshman guards are still young, but starting to understand what we need,” Dean stated after the game. “Madelyn Fearon is doing a dynamite job handling the ball and tonight we needed her help in that area because Austy Miller of Bradford is a tough athlete and competitor and they just kept coming after us. “Bradford coach Chris Besecker did a nice job countering us and making adjustments as the game went along and we had to keep adjusting as well. He’s a really good coach and that team has come a long way despite the injuries they are dealing with right now and were happy to get the win tonight,” Dean concluded. Arcanum was led by O’Daniel with 17 points and Unger had 10. The Trojans improve to 13-6 and 7-3 in the CCC and will play at Newton on Thursday. Bradford – Abby Gade 3, Austy Miller 9, Emma Canan 8, Abby Fike 6, Rylee Canan 4, Cassi Mead 4, Bianca Keener 6. Totals 2-16-2/4 – 40. Arcanum – Gracie Garno 6, Camille Pohl 4, Madelyn Fearon 5, Hailey Unger 10, Kayla O’Daniel 17, Taylor Gray 5, Eva Siculan 1. Totals 1-17-11/17 – 48.